When we moved here, the lawn between the house and the fence had a number of roses and three camellias dotted around. 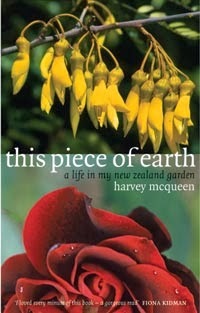 Harvey was still able to do some gardening then, and he had very definite ideas about what he wanted to change. So we took out the two least attractive camellias, letting much more light in on the struggling roses along the fence, and added a neighbour's gift of the apricot abutilon. For his birthday Ali and David gave us a lovely red Dublin Bay climber to plant in the gap opposite the sitting room, right where Harvey could see it. But it still looked very spotty, everything dried out quickly, and when I had to take over I found it hard to keep up the watering. When Ali stayed with me the week after Harvey died, she thought about my garden. A little later on, at exactly the right tactful moment, she talked to me about the idea she had for improving it: digging up the lawn along the fence in a long curving ribbon shape, to take in all the plants, and covering it in mulch to keep the soil damp. Hopelessly ignorant about gardening as I am, I could see straight away that it would both look much better and be much easier to manage. Somehow the prospect of making a real change like this gave me something to look forward to and really lifted my spirits. I did wonder what Harvey would have thought of it. But long before he had said, very sadly, that it was now up to me to manage the garden and he'd just have to take a back seat. Besides, he usually approved of what I did, once he saw it. So when Ali arrived yesterday to make a start, I felt both delighted and also slightly daring, making quite a big change to the landscape on my own account. We laid out the hose to get the right shape, then she dug a beautiful line all along it, cutting out the lawn into neat squares and using them to build up the soil along the fence, where it sloped away. I was amazed how much she managed to achieve. By mid-afternoon I had a whole new layout and it looked so much better. Instead of just being dotted around, all the plants were contained in a lovely curving ribbon of garden that looked as if it was meant to be there. Later she and David will bring the mulch, and once we've spread it I can think about what else I could plant in the gaps - only knowing my limits, everything will have to be as sturdy and undemanding as possible. Maybe some kind of daisy...and definitely a lemon tree. It feels like my garden now. What a process it is, making a whole new life alone. I've done it 3 times, through separations and it's got easier each time (the advantage of practice) . But for you, after so long with Harvey, it is so major. I've just found your blog after listening to your interview with Kathryn Ryan. I totally concur with what you say about the evening meal being a crunch time. Wishing you well Anne, with life and with future writing. Today I listened to your interview on radio national. I really was touched by your story. I now decided to follow your blog. I continue to value this special blog Anne. Your Downer and Ribbon Garden are such a beautiful duo of posts. So often people move away or quickly past the harder times, but your Downer holds some of this experience in care-full ways. I'm so glad the garden may be a new and engaging way to navigate these next chapters of life for you. I'm v sorry I missed your radio interview but hope you are having a good week and that others will be drawn to the significance of your blog following that interview.